I have recently discovered a wonderful invention….. Oven Roasting Bags! Not only does it keep food from cooking into and caking onto my pans, it helps my food cook evenly and keeps on the juices and seasoning locked into the meat. I honestly used to think that to be a good cook I had to do everything the long or hard way. If I still thought that, I’d never do anything but cook! I have a job, a family, school work, and a life! So I realized, you can take some short cuts and the food still tastes wonderful. Which is what really matters anyway…. Not how you got there. So last night I had some wonderful long lost friends come over. I made a chuck roast and potatoes marinated in garlic and herbs in an oven roasting bag. 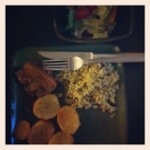 I also served long grain and wild rice pilaf with almonds and a nice simple side salad. I felt that the roast came out a bit tough and I wish I had the time to marinade it over night like usual. There was a comment that the rice tasted buttery (which isn’t necessarily bad thing if you like buttery). This comment lead to several minutes of trying to figure out why, because I had not added butter. 🙂 I’m not sure if we ever came to a conclusion…. But I love you anyway Brandon. All in all it was a good meal and a great evening with friends. I couldn’t have asked for a better night!